I postponed Sunday’s Shining Star today due to technical difficulties with blogger. It has been hit or miss with it all week. Seeing that for me, it’s been on a miss basis, I felt that I couldn’t draft up the post in advance giving the blogger enough notice so I thought it best to not have it. But instead I showcased an author the other day, Lynda Fishman, an incredible woman who has had an amazing life and has written her memoir. She just sent me this guest post that was a tad bit late, but I would like to share it with you today. So once again. Ms. Lynda Fishman…………. This is a remarkable true story of a thirteen year old faced with horrific tragedy, and the journey she took from disaster to life fulfillment. Rita and Saul had a fairy tale life. Rita, a woman with a heart of gold, was a caring, kind and generous wife to the jolly and friendly Saul, who loved to giggle at his own jokes. Their three adorable daughters, Lynda, Carla and Wendy knew the perfect family life that many children can only dream of having – a very close-knit family in a home filled with riches – not rich with money, but with priceless love and happiness which they shared with extended family. Sweet tunes of music from the big brown radio in the kitchen echoed through the bustling household that was often filled with laughter and celebrations with relatives. The aroma of delicious dinners permeated from the kitchen, and the entertaining piano playing and dance steps of little feet in the living room was performed with joy. The three sisters have never flown and are looking forward to the plane ride and the family Bar Mitzvah in California. Young Lynda convinces her parents to let her fly a week ahead with the grandparents to help get everything prepared for their month long stay in California. A week later, Carla (11), Wendy (8) and the mom, Rita (39), board a flight from Montreal bound for LA, with a stop-over in Toronto. Their Air Canada flight 621, with 109 people on board, crashes seven miles from the Toronto airport. There are no survivors. It was pilot error. Saul receives a horrific phone call with tragic, shocking news that changed everything. His family has been extinguished in an instant. Inconceivable. In a state of complete horror and despair, Saul is completely emotionally paralyzed. Unable to move past that terrible day, Saul withdrew into himself, struggling and distraught, leaving thirteen year old Lynda alone in her grief. Never again the father she knew, Saul, too broken to recover, was so immersed in his own grief that he simply continued to exist, in a state devoid of life or hope. Lynda, at the young age of thirteen was basically orphaned. She officially lost her mother and two younger sisters and unofficially lost her father too. Teetering on that tender brink between childhood and adolescence, Lynda faces profound loss, the responsibility of a father in a complete state of shock, a house to take care of, and complicated decisions about how to proceed with their shattered lives. Their home is transformed from comfort and joy, to despair and deafening silence. Terrifying sounds of crying shatter the silence in the house – sounds of sadness and misery emitting from a broken man and a terrified young teen. Saul and Lynda are unwillingly assigned to a new category of heartbreaking loss, one that not many people will ever experience. Faced with agonizing memories of funerals, nightmares, sorrow and hardship, a young teen and her dad are left to cope with immense grief and loneliness. Pursued by ambulance-chasing lawyers, Saul becomes involved in an overwhelming and intimidating legal battle with Air Canada. What happened behind the headlines was different than what the public was told. Shockingly, Air Canada’s ruthless, insensitive legal team handled the aftermath of the plane crash and the subsequent law suit in a callous and heartless manner. With complete lack of sensitivity, the family was subjected to hours and hours of depositions as they itemized the dollar value of a mother and two little girls. Saul was essentially bullied into settling for what was obviously a ridiculously low settlement. Unable to face the reality of this colossal tragedy, Saul is stuck in a state of emotional denial, pushing his daughter further and further away. Pursued by a pretty widow, Saul quickly marries Sonia who personifies the evil stepmother stereotype in all the darker senses of the word. Controlling and self-absorbed, Sonia wedges herself between Lynda and Saul, constantly forcing Saul to choose between them. For years to come, Lynda is hurt, frustrated and angry at her father. At age seventeen, Lynda meets and falls in love with Barry, her soul mate. Barry has also suffered tremendous loss – his mother died when he was an infant, and his father died when Barry was seventeen, just a few months before meeting Lynda. To make matters even more interesting and challenging, Barry has a developmentally delayed brother, a few years older than him. Barry and Lynda are left with the responsibility of Mitchell. The shared bond of pain allows them to form a deep, mutual understanding of each other. You root for them as they build their relationship, get married, start a family and balance each other perfectly. Their lives flourish together. They are dedicated to each other and to helping others. The final part of the story deals with life-changing and comforting visits to a Psychic Medium. Lynda and Barry receive specific, detailed messages and information from their family members on the other side that validates their on-going connection – illustrating without question that while they can’t be with them physically, they have stayed with them. It warms your heart to learn that Lynda and Barry’s family members are “alive and happy” in another realm, and that they have stayed among them as angels, guiding and protecting them. It is obvious throughout the story that “we always have choices” and that it is possible with perseverance, courage and patience to be able to live life once again. Lynda made the choice to do everything she could to escape the cloud of despair. She chose to bounce back after such a monumental tragedy, to pick up the tragic pieces of her life and move on. She chose school, growth, positivity, career, family. She chose to stay super busy with school, volunteer work at hospitals, cooking, baking, gardening. She chose to fight the obstacles of pity. She chose hope over despair. She chose to survive and to thrive. Both Lynda and Barry were determined to live – they chose to create a happy future and to live a happy life. They have strength, will and courage. They were determined not to succumb to sorrow and despair – to use whatever tools they could find, including considerable grit, to build a life together – to fashion the life they wanted. Together, they had and still have indomitable will to focus on the positive. Prepare yourself for an emotional roller-coaster ride through gut-wrenching trauma, incomprehensible loss, terror, anger, hope, tenacity and triumph. It is powerful not only in regard to the tragedy, but in the messages delivered throughout the story. This is a story of victory – of rebuilding – of the immense power of positivity. Repairing Rainbows is a story for everyone who delights in true-life accounts of triumph over tragedy. Repairing Rainbows resonates long after you finish the book – it is an unforgettable story of courage, strength and hope. 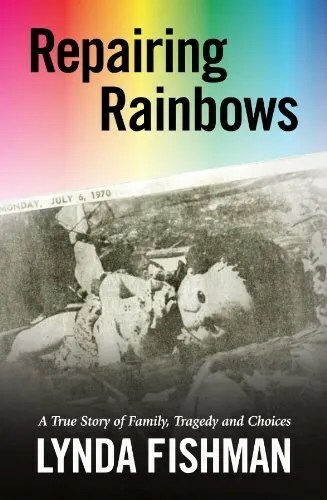 Repairing Rainbows is described as compelling, captivating, honest, brave, and inspirational. It is a truly special story about choices – a story that reminds you that you should never give up, keep on trying, and that every storm ends with a rainbow. There’s no template to follow that will determine the course of any tragedy and the effect it has on ones life. But the toughest decision a person has to make is whether or not they are choosing life. Whether or not you respond to a crisis with hope, is a choice. It’s a choice about whether you want to live or die. Lynda chose life.